THE PLATED SERVICE = less food, less choice, more staff, less dancefloor space (due to the need for extra space for the servers to walk up and down - technical I know!) and most importantly more money! There was another option, giving the best of both worlds –a ‘Lazy Susie’. This is a round glass turn-table that sits on top of the actual table; it spins around, allowing guests to serve their own food without leaving their table. Genius huh? This, however, still incurs some of the ‘staffing costs’, as the food still has to be taken to each table…. For us, it was a no-brainer and it worked out ‘delight’fully (see what I did there!). 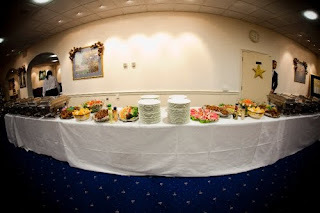 The buffet created a less ‘formal’ and more relaxed atmosphere. I still think it is lovely to treat guests to a plated meal if the benefits outweigh the costs, and I’ll be keeping this in mind for when I host a slightly smaller celebration! Round 1: We served canapés to our guests – but we didn’t even remember to taste any – having gotten distracted by the steel band when we walked into the foyer! Round 2: For the main meal, we wanted to reflect both our cultures in menu and so had a combination of savoury rice sticks, jollof rice and waakye (Ghanaian style rice and peas) as our main starch component (gotta love the carbs!). This was accompanied by stews, chicken, fish, amongst other items. It was all beautifully presented. Louise did us incredibly proud! Round 3: After everyone had served the main meal, Delicate Delights cleared the buffet spread away and turned it into a dessert station – fabulous. Can you believe that we didn’t eat any dessert – we were just having too much fun! Round 4: Later in the evening, some ‘small chops’ were served, included roast beef kebabs and ‘pepper’ chicken – YUM. Again, we didn’t eat this either – but, Delicate Delights packaged a bit of EVERYTHING and had it delivered to our hotel suite. Now that was exactly what we needed at the end of the long day. Needless to say, nobody went hungry! So, how did our 230 guests serve themselves without pushing, shoving, cuts and/or bruises! ? ! 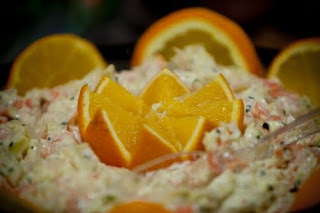 * Firstly, it helped that our guests had already had something to eat (see Round One). They weren’t starving! Big bonus! * We had a long buffet table set up to the rear of the dance floor. 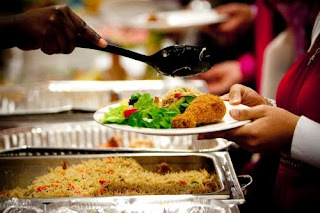 We had duplicates of each dish, so that guests could serve more quickly. Essentially, it was two identical buffet tables joined together – clever huh! * Mr O and I were the first to ‘view’ the buffet table; I figured we wouldn’t get a chance to see it otherwise. Dinner was then served for us and the rest of the top table…at which point we decided not to eat! Lol and went round to greet our guests. By the time we took a break to eat, the food was no longer piping hot, but is still DELICIOUS! I might just be asking for the recipe of those rice sticks! 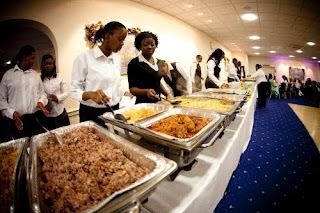 * We also had a fabulous Chairman, who expertly encouraged guests to serve. He did this in an orderly fashion - calling the next table to serve as the preceding one was nearly finished. It helped that we gave him a ‘map’ of the room, with all the table names and their locations on it, so that he knew exactly which table he was calling to go up! There was no mile long queue and lots of guests remarked at how smoothly the whole buffet thing went. Overall, I’d give the catering a 10 out of 10! There really isn't anything that we would changed! 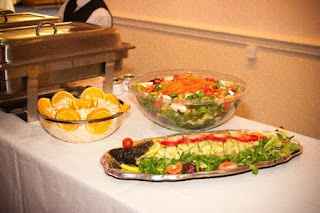 The food was amazing, the presentation was great, the staff were fantastic at clearing tables and assisting with the serving of food. What more could we have asked for? Louise, of Delicate Delights, did an outstanding job and as with most of our vendors, has our highest recommendation!